Modern architecture is trending towards homes and businesses that take up more and more lot space, leaving very little left for landscaping. Because of this, owners of these properties have to put more attention into landscaping the small remaining spaces: not only to increase the curb appeal of a home or business, but also make sure to have a space for homeowners and employees to enjoy their time outdoors. Learn how you can make big things come in small packages, creating a huge impression with tiny lawns, yards, and narrow paths. Before you think about planting and hardscaping, the first thing to do is look at your available space. Unlike with bigger landscaping projects, these smaller areas are a lot less forgiving when it comes to measurement errors and mistakes. Think about the space you have, and compare it to your landscaping desires. This is a great time to call a landscaper in for a consultation. They can help you figure out layouts that can meet your demands and look good doing it. When it comes to landscape design for smaller spaces, several aspects are more important than ever. Due to small available square-footage and cramped areas, consider the following factors closely. Access and Flow: How will you move around your property? Think about walkways and paths and how to adjust them for cramped parts of the area. Rest Areas: Where do you want to relax? 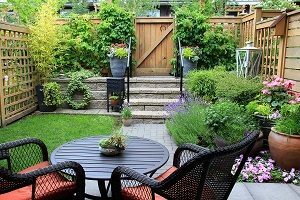 Think about patios and other hardscaping, as well as space for screening plants and fences. Lawn Decision: If you have the area or have an existing lawn, it’s time to decide. Do you want a lawn on your property, or would to rather utilize that space for something else? Once you’ve come up with a design, it’s time to start thinking about the installation. You’ll have many options and materials to choose from. Because of the smaller space, here are a couple things to consider. Since you’ve got less room, make the most of it. When given options between two materials or features, take a hard look at the options that are more durable, convenient, and aesthetically pleasing, even if they cost more. Thinking about a fire pit? Maybe choose gas over wood for convenience and less bulk. Likewise, look at more durable hardscapes with more construction and digging, but that will last longer. While your available lot space may not be much horizontally, think vertical when it comes to plants. Choosing vines, or plants with the columnar or fastigiate (shrubs and trees whose branches grow near parallel with the main stem) can give you greenery that won’t take up too much space. Just because your property has a large indoor footprint and a small outdoor one doesn’t mean you shouldn’t have a landscape you’re proud of and provides the relaxation and outdoor lifestyle you wish to have. If you’re interested in learning how to turn your small space into a big asset, it’s time to contact Greener Horizon. We can help with commercial projects such as condos or office lots, as well as private residential homes.